Showcase Chowdowns 1 - The Rainbow Wheel! Here is the video of the very first Showcase Showdown in its entirety, downloadable in two clips! The very first full shot of the very first Wheel. Here is the first part of the very first SCSD! Sorry, guys. She's mine. ...ahem... Here is the second part of the very first SCSD! 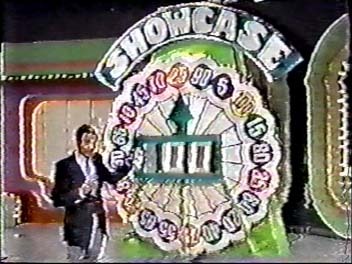 The second Showcase Showdown is the first time anyone ever won $1,000 on the Big Wheel. 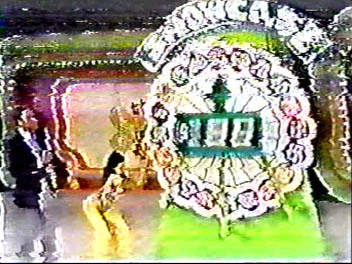 Unfortunately, it is widely known among tape traders that the video quality of this portion of the show is awful. In order to make it worthwhile, I have chosen to make this simply an audio clip for download (2.99 MB). However, I have digitally enhanced some stills in order to aid your imagination! ** NOTE: It takes a long time to doctor up these still shots so be patient! I only have two done. This contestant wins $1000 on the Big Wheel. This brings up an interesting situation. It is obviously a spinoff and a Bonus Spin, except they didn't have bonus spins until around December 1978...but wait, what is this Bob is saying? A contestant who gets $1.00 in one or two spins in the Spinoff gets another $1,000! It must be reasonable to say, however, that if only one person won $1,000, then that person would not get the opportunity to keep spinning for more bonus money. However, if two people tie and $1 is achieved in the spinoff, then that person will win $1,000 even if $1,000 was already won! In other words, it was possible in only the strangest of circumstances to win $2,000 or even $3,000 at the Big Wheel. The first spinoff spinner attains a score of 95 cents. ...she doesn't get quite enough in her second spin! 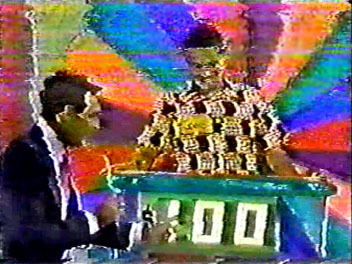 You can see more of the Rainbow Wheel in action on the Price is Right DVD set. Go on to SCSD Page 2 - Extreme Spins!